What do you picture when you think of Bangkok? The untreets, of course! Chaotic streets, crowded with tuk-tuks, motorbikes, street food vendors, and throngs of people. The sounds of the hustle and bustle of city life and the aromas of foreign and often unidentifiable cuisine filling the air. Lively markets and monstrous shopping malls, so sprawling that it’s impossible to discern where one ends and the next one starts. 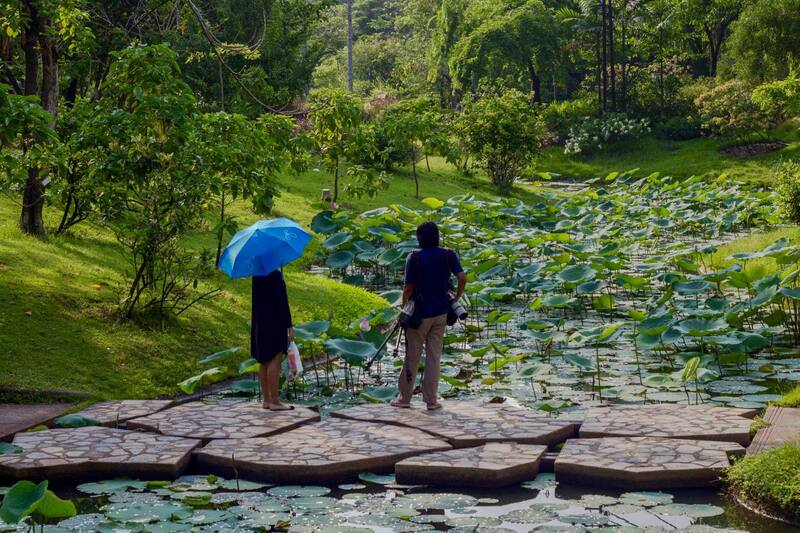 Time out in nature is rarely even a passing thought on most people’s Bangkok itinerary. It’s such a vibrant city full of culture, cuisine and people, and like most urban areas, is not exactly known for its open green spaces. Besides, with so much else to do and see, few would acknowledge the possibility of doing something as lethargic as lounging in the grass. But we all need a break sometimes, and nature is the antidote to the chaos found in the rest of Bangkok. This city’s green spaces are few and far between, but there are probably more than you think, and they’ll provide a much-needed shot of relief for anyone weary from the overpowering urban-ness. 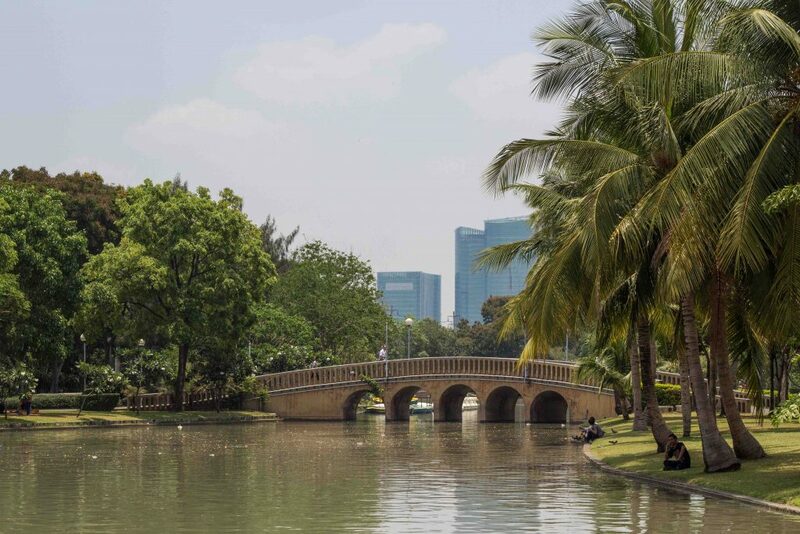 A few hours in one of the best parks in Bangkok can refresh your spirit of adventure and give you the will to explore that next neighborhood or taste that street vendor’s concoction, rather than retreating to the familiarity of your hotel or a TripAdvisor-reviewed restaurant. For digital nomads like us, the parks below were also refuges from working at our computers and the stresses of deadlines. 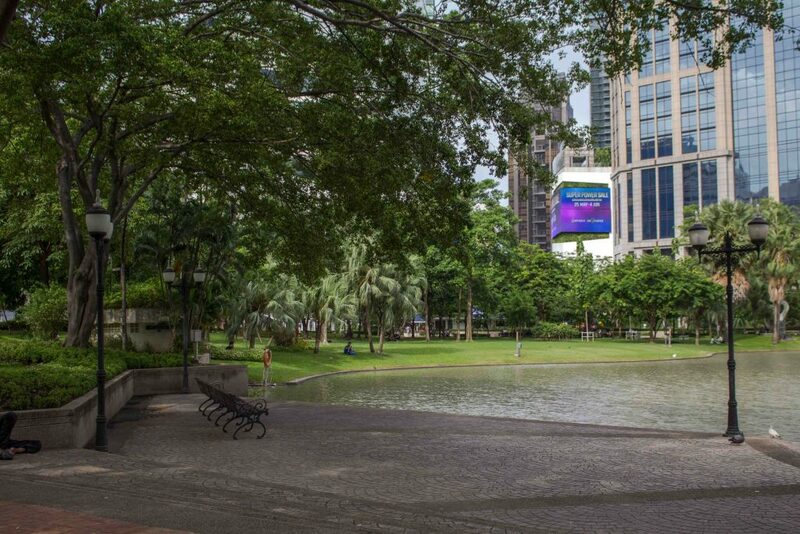 Lumphini Park is Bangkok’s first and most popular park, and it’s just a fifteen-minute walk from the hordes of people at the 2-million-square-foot Central World mall. Created in the 1920s, Lumphini was designed as a respite from urban living, and at that time was actually outside the city limits. Today, surrounded by skyscrapers, it still feels a world away from the commotion outside its gates. The northern half of Lumphini centers around a large lake with an island in the middle. For about $2 an hour, visitors can rent swan boats to explore the lake and slip under the bridges that provide access to the island. You can also stroll around the park’s system of walking paths or just enjoy lying in the grass – reading a book, listening to music, or just staring up at the trees. In Bangkok, it’s not often you can escape the honking horns or the buzz of motorcycle engines, so it’s nice to just lie back and take in the sounds of nature. If you need a break from the heat, the south side of the park has a branch of the Bangkok Public Library. When we wandered through, we found that the only books in English were from the reference section, but we enjoyed the air conditioning nonetheless. If you spend much time in Thailand, you’ll quickly notice something – Thais are really into outdoor fitness (this is actually the case across much of Southeast Asia). Public aerobics classes with hundreds of students seem to pop up from nowhere, and most parks have some odd-looking gym equipment that I never know how to use properly. As such, Lumphini has also become a hot spot for outdoor exercise in the city. Near the park’s southwest corner, there’s even an indoor air-conditioned fitness center that offers memberships for the astoundingly low price of 50 baht ($1.50) per month. 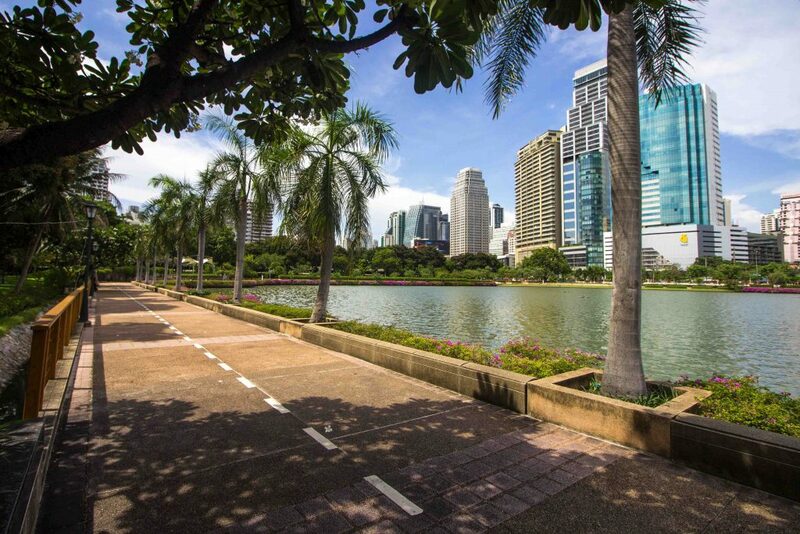 Lumphini’s only downside is its popularity; there are plenty of places to spread out if you want to enjoy a picnic or read a book in the grass, but the paths encircling the park can get crowded with runners and fitness enthusiasts, especially in the evening. 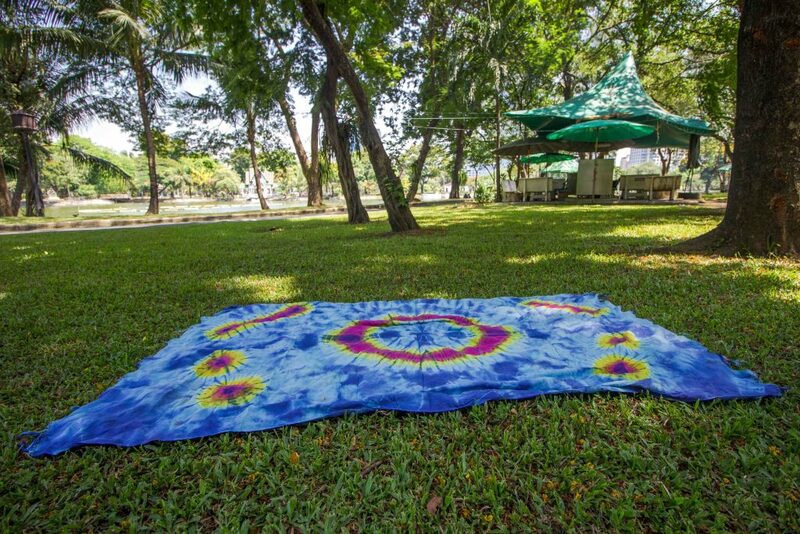 What to do at Lumphini Park: Go for a swan boat ride, and then lounge in the grass with a book. Despite being one of the largest parks inside the city, Benjakiti Park seems to be forgotten by many tourists. Built on the grounds of the former state-owned tobacco company in 2004, it was created for the express purpose of making Bangkok’s crowded downtown area more livable. The rectangular park is centered around the 30-acre Lake Rajada; actually, this park is more water than land. The park provides an open space for viewing the Asoke neighborhood’s spectacular skyline, which is amazing at night. Beautiful pink and purple flowers bloom from the gardens lining the walking path around the lake, while palm trees frame nearby skyscrapers to create a scene that would almost fool you into believing it’s in southern California. Perhaps the most unique feature of Benjakitti is its dedicated cycling path. 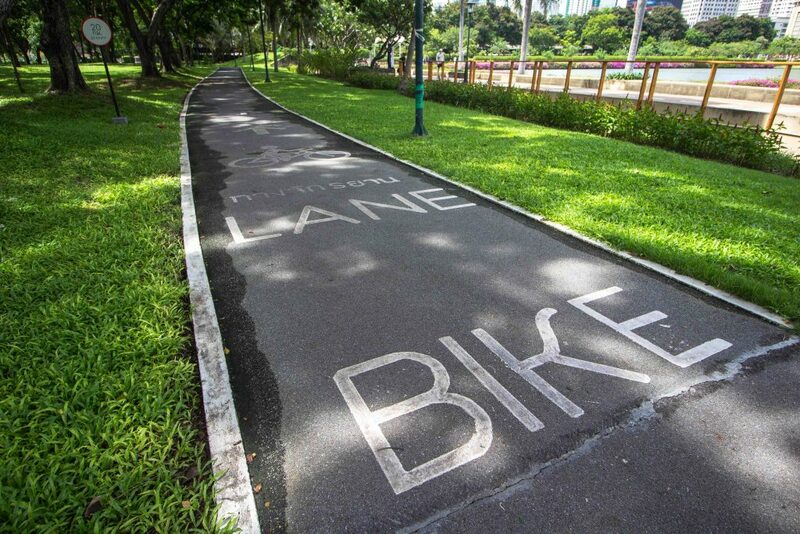 Lumphini only allows cycling for a few hours during midday, because it gets too dangerous for cyclists to share the paths with runners and other pedestrians at more crowded times. But here, the dedicated bike path allows cyclists to ride without interruption, though an 18-mph speed limit is supposedly enforced. There’s a bike rental kiosk near the park’s southern edge, where you can get a set of wheels for just over a dollar an hour. You won’t find the nightly fitness groups here as you would at Lumphini, but there are a couple that use the lake’s wooden piers a few times a week. You can also rent a paddleboat for a couple dollars an hour, though paddling around this lake is pretty uneventful compared with some of Bangkok’s other parks. 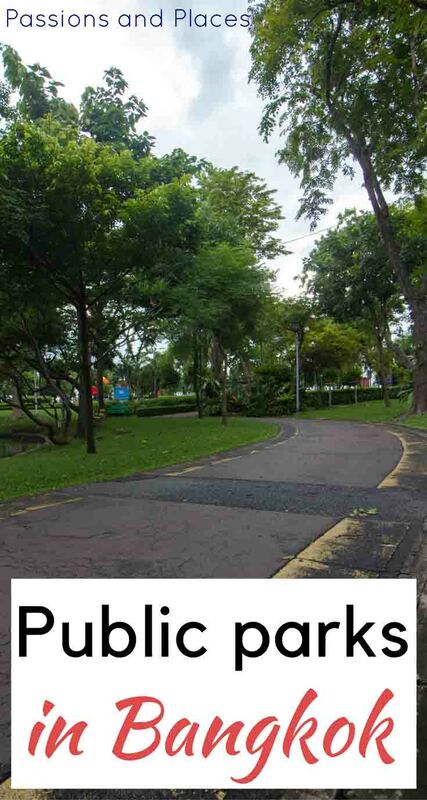 What to do at Benjakitti Park: Go for a bike ride (one lap around the lake is about 1.25 miles). 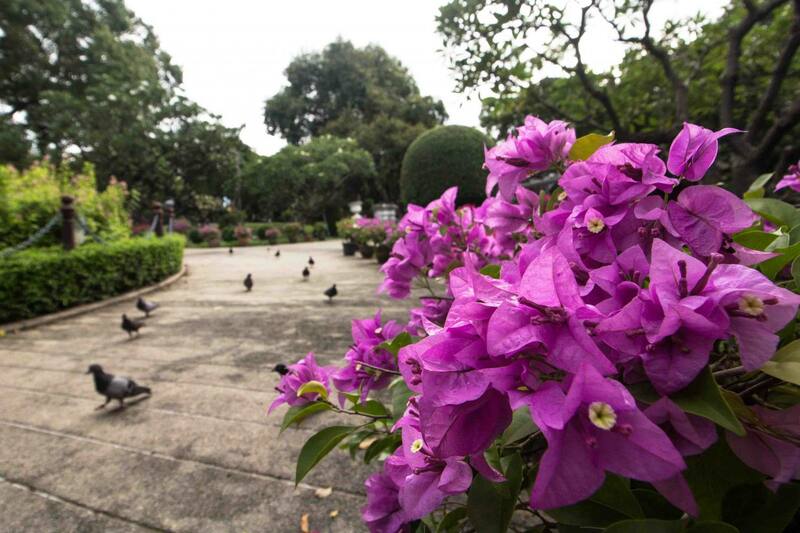 At just over ten acres, Benchasiri Park is one of the smallest parks in Bangkok, but what it lacks in size, it surely makes up for in accessibility. Located just outside the Phrom Phong skytrain station and minutes from the luxurious Emporium shopping mall, it’s the perfect oasis on the hectic Sukhumvit Road. 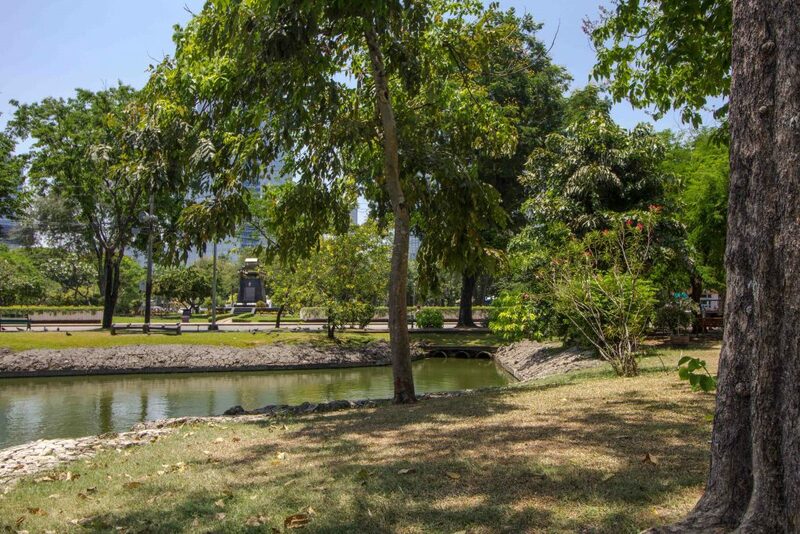 This park was created in the early 90s to celebrate the 60th birthday of Queen Sirikit and was built on the grounds of the Bangkok Meteorological Department. Its centerpiece is an artificial pond that acts as a reflecting pool for the adjacent Emporium Tower. The pond is a bit too small for paddling, so most people just enjoy watching the birds flocking around it (don’t feed them, though – this encourages aggressive behavior, and the foods people typically give are bad for them). Benchasiri is a popular place to squeeze in a morning run; a lap around the park’s main path will only net you half a mile, but you’ll be in good company, with dozens of locals running alongside you. There are a few exercise machines scattered along its western edge, but I would be hard-pressed to explain how any of them are used to get a decent workout. If you need things to do in Bangkok for kids, there’s some play equipment near the exercise machines. There’s also a skate park at the rear of the park if you’ve got the gear and would like to do some grinding. What to do at Benchasiri Park: Take your kids; there’s lots of play equipment, and they’ll probably enjoy some time outside after a day of shopping at Sukhumvit’s mega malls. Chatuchak Park is mostly known as a weekend market, but that market is attached to a massive park – actually, three parks in one: Chatuchak, Queen Sirikit, and Wachirabenchatat, together forming the largest green space (over 250 acres) within Bangkok’s city limits. 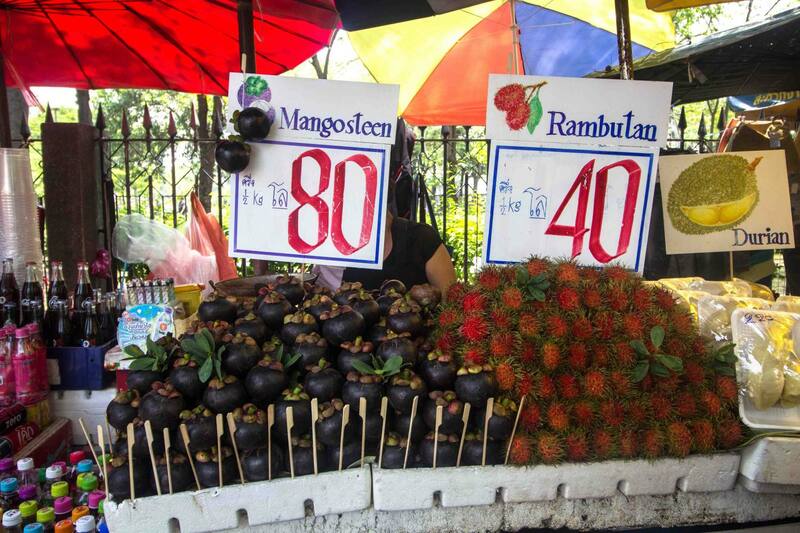 Each section has its own unique flavor, but the best time to visit is on a weekend, when Chatuchak Park transforms into Chatuchak Market (also called JJ Market). 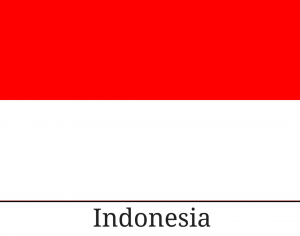 With over 8,000 stalls and 200,000 visitors per day, it’s the largest market in the world. 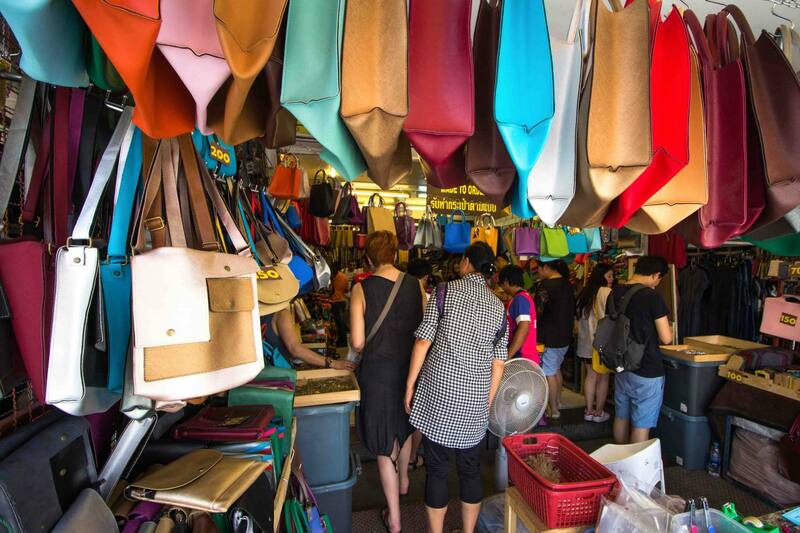 Locals, foreigners, and Thai tourists flock to Chatuchak every weekend to find great deals, buy unique handicrafts, and chow down on an amazing selection of street food. We enjoyed plates of vegetarian pad thai and a mango smoothie, but this is one of the best places in Bangkok to broaden your horizons and try some dishes you’ve never seen or heard of before. The market can be pretty overwhelming, and if you’re looking for something specific, it will feel nearly impossible to find. But Nancy Chandler, who draws some beautifully detailed maps of cities in Southeast Asia, has a directory of the market showing what the stalls in each area sell in her Bangkok edition. You can pick one up from her office (in the Bubhajit building near the southeast corner of Lumphini Park) or have it delivered to your hotel, and they’re also available in some bookstores and souvenir shops. 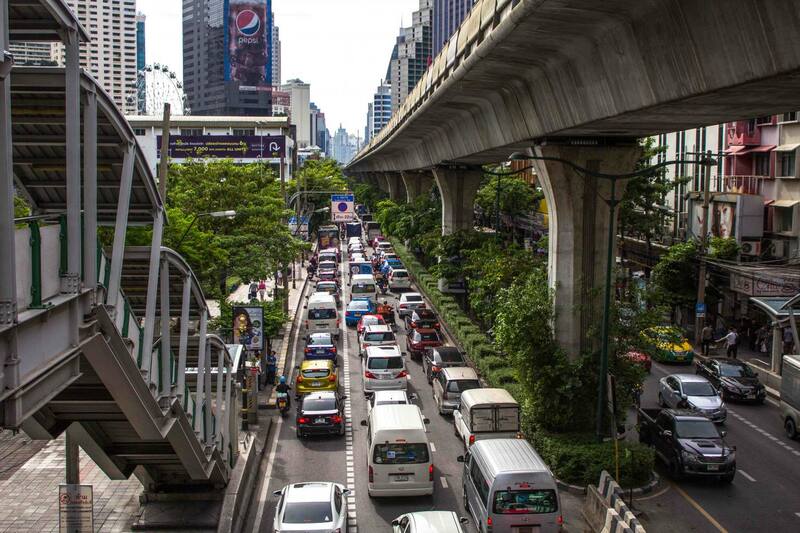 Technically two separate parks, Queen Sirikit and Wachirabenchatat can be thought of as a single space, and they both see less traffic than Chatuchak Park. They’re further from the train stop and have a more “rural” feel, if you can ever say that in a city of over 8 million. 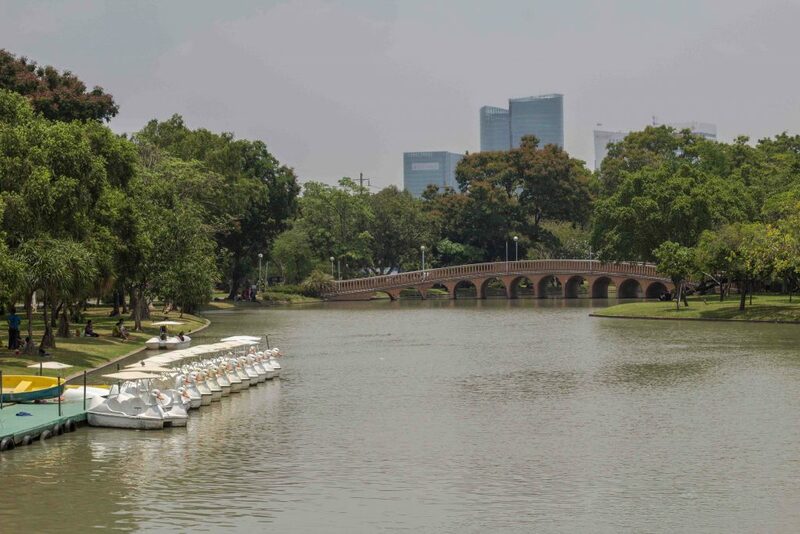 Queen Sirikit is designed as a botanical garden with walking paths crisscrossing a narrow pond, while Wachirabenchatat (commonly called Rot Fai) is built on an old golf course, and the fairways are still readily apparent. 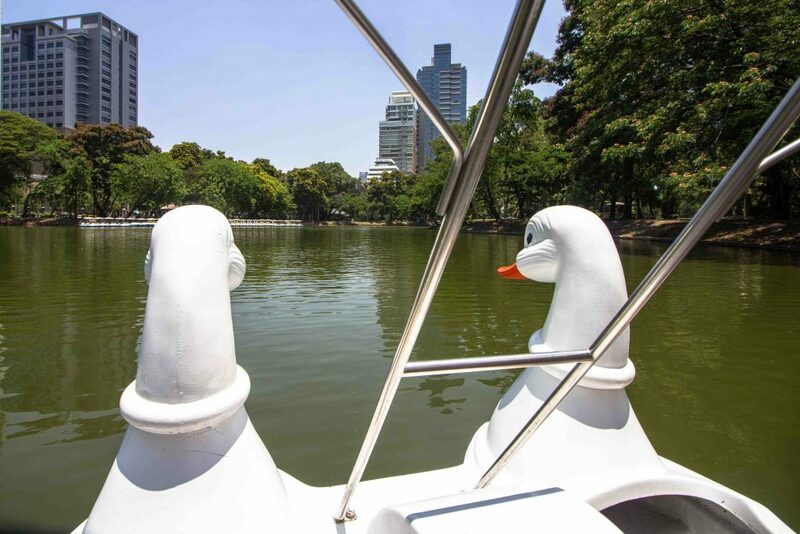 It’s home to a large lake where you can rent swan boats for about $2 an hour. The shores can get crowded on the weekend, but during the week, the park can feel almost deserted. The trails weaving through the three parks at Chatuchak make for the longest unbroken pedestrian walkway in Bangkok, and it’s a favorite among runners. Most of the other parks necessitate tedious laps, but the Chatuchak complex is not only massive, it has a variety of routes to mix it up. Free yoga classes are also offered a few days a week near the entrance to Wachirabenchatat Park. 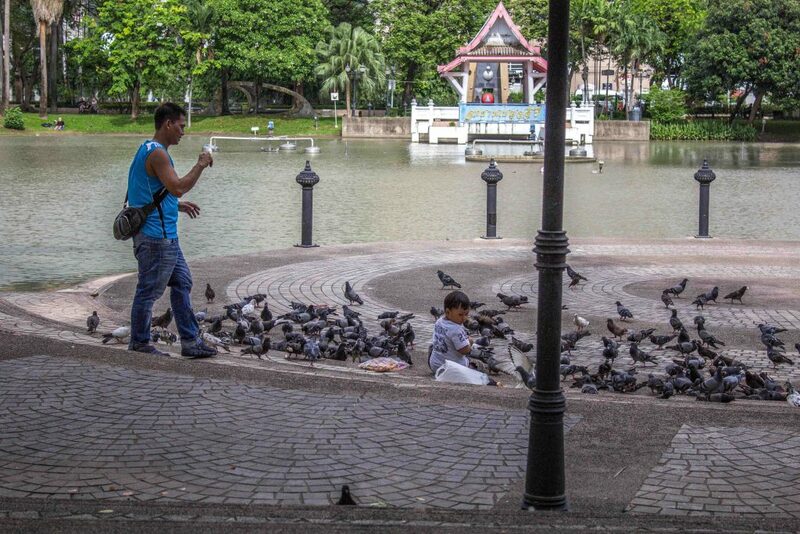 What to do at Chatuchak Park: Go to the weekend market, then enjoy a picnic of Thai treats. Unlike the other parks mentioned here, Saranrom Park is not accessible by train, but it’s located across the street from the Grand Palace. This park was originally part of the palace gardens, and later served as a private zoo before becoming a public park in the 1960s. Its historical use as a green space means it has large mature trees that provide shade for park goers, while the trees that populate the newer parks are much smaller and don’t do as much to protect visitors from the blistering Southeast Asian sun. 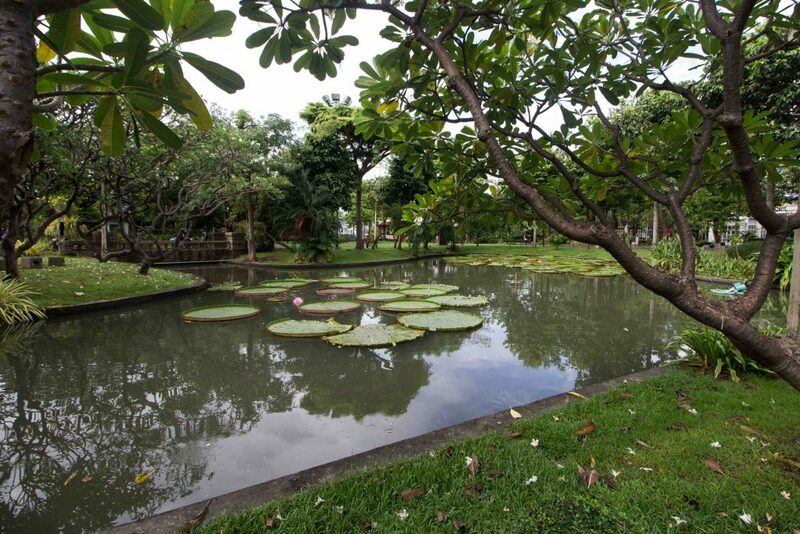 Saranrom consists of a fairly small square of grass surrounding three ponds, with a walking path weaving through it. This park’s small size prevents it from being much of an exercise area, but it’s still a welcome respite from the heat and humidity, as anyone who’s stood in the long line outside the palace can attest to. There’s a playground near the northeast corner, which is great if you have kids itching to roam free after a few hours on a guided tour. 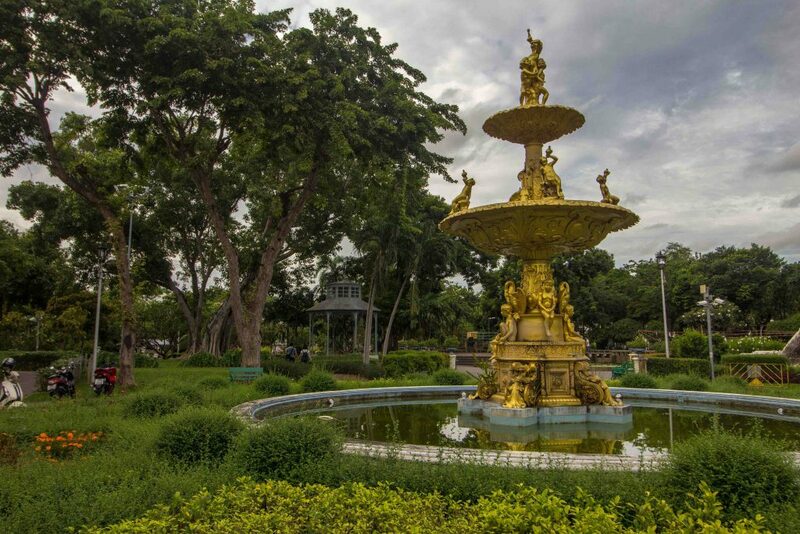 This probably isn’t a park that you’ll want to make a special trip to, but it’s a great place to visit if you’re in the nearby Chinatown neighborhood, staying at Khao San Road, or visiting the Grand Palace. What to do at Saranrom Park: Relax after a visit to the Grand Palace. As a whole, Thailand has some astounding places to get outside: hiking the mountains up north, scuba diving off the islands, or exploring temples in Ayutthaya or Sukhothai. But while you’re in the city, there are still plenty of green spaces where you can work up a sweat, enjoy a picnic, or just decompress after a chaotic day. 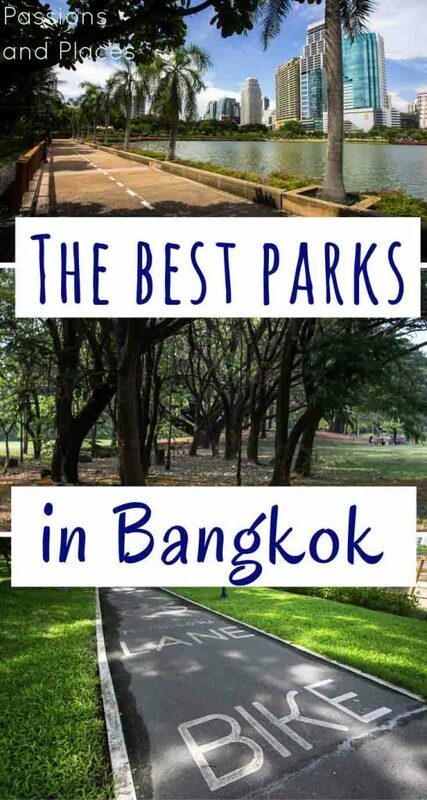 The best parks in Bangkok are the perfect counter balance to the all the sightseeing (and sensory overload) the city has to offer. Do you know of other places to embrace nature in Bangkok? Tell us in the comments!